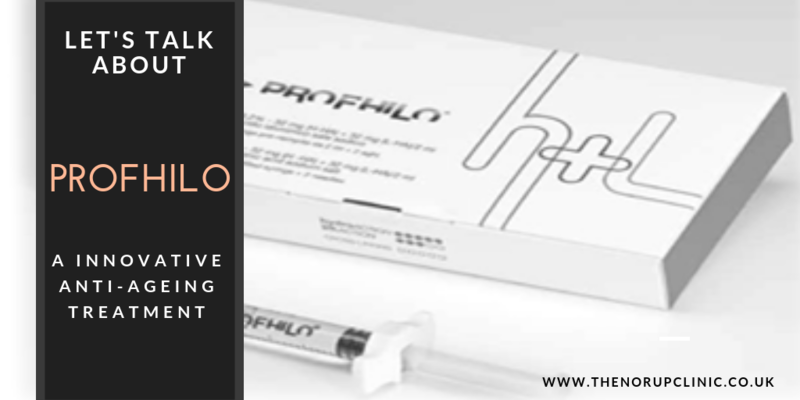 PROFHILO® is the only product known to stimulate the growth of all four kinds of collagen and elastin, smoothing out wrinkles and visibly tightening the skin. Rather than just treating the wrinkles that already exist. Profhilo encourages the growth of collagen and elastin to prevent the growth of new wrinkles, effectively remodelling your skin from the inside out. From the age of about twenty, each year we lose around 1% of the collagen and elastin from our skin tissue. Collagen and elastin are the building blocks that give the skin its plumped-up, healthy appearance. As a result of this gradual depletion, the skin becomes thinner and as the time goes by it has less and less of its youthful look and feel. A major concern for a lot of people as they age is wrinkles, sagging skin and poor skin quality. Thankfully, our industry keeps moving and innovating to provide products like Profhilo. This new natural hyaluronic acid injectable, is a naturally occurring substance which moisturises the skin. It can be used on the face, decolletage, hands and neck. The global effects of this breakthrough treatment are clearly visible in the skin quality across the face. 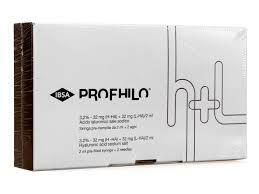 Profhilo is the first BDDE-free, stabilised injectable HA (hyaluronic acid) based product for treating skin laxity. It boosts and hydrates the skin, while also remodelling the ageing and sagging tissue. It’s a stabilised product that is developed by using a patented technology resulting in hybrid cooperative complexes without the use of any chemical cross-linking compounds. 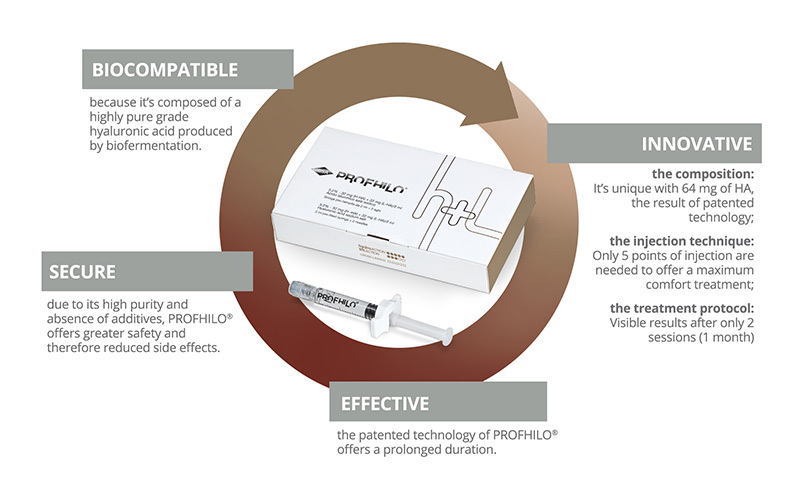 Once injected, Profhilo lasts in the skin around 28 days. During this time the stimulation of four different types of collagen and elastin takes place by slow release of HA. This stimulation results in significant tissue improvement, such as significant tightening/lifting effect on the tissue. 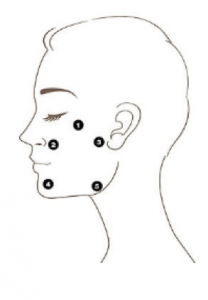 The BAP Technique (Bio Aesthetic Points) is based on 5 injection sites specifically chosen to minimise any risks while maximising the diffusion of the product in the malar and submalar areas. The injection is slow; therefore, there is reduced pain, lower possibility of bruising or hematoma, reduced number of treatment sessions and greater patient compliance. The treatment consists of two sessions 4 weeks apart. Assessment of the treatment is 8 weeks after the second session. Generates stabilised hybrid co-operative complexes of H-HA and L-HA which increases the expression of lebels of type I and type III collagen in fibroblast and type IV and VII collagen in keratinocytes. Resulting in improved skin quality and skin hydration both in the dermis and epidermis. Volumetric effect- the lift effect – Endogenous HA and Elastin give the skin. The outcome is significant increase in collagen and elastin production, delivering visible improvements to overall skin health, elasticity, sagging lines and wrinkles.